This novel is cold. An ever present dampness, ‘wet from the river and wet from the rain’, seeps underneath the door and somehow all the jumpers and blankets in the world won’t warm you through. Of course, it doesn’t help if you keep forgetting your gloves and there are no curtains in your bedroom. But no one is around to remind Harry, apart from his older brother Miles – and he is helping Dad on the boat most days now. There is no one to meet the boys after school and no one to make sure there is bread or milk. The brothers look after one another as best they can: an extra teaspoon of Milo for Miles to stave off a cold; an impromptu sleepover at Stuart’s place for Harry when Miles cops a blow from his father after two days of drinking. Folk help out as best they can and there are moments of reprieve from the bleakness: the simple pleasure of catching a fish and cooking it on a hot plate over the fire and the delight of finding a 20 dollar note at the Regatta and spending most of it on lollies. But these kindnesses cannot replace the missing parts of their childhood and the landscape underpins this loss: ‘When the forest was cleared it never looked right when it grew back. It was missing bits.’ It seems as though the town itself bears down on its youth and leaving is a matter of survival (‘I just gotta get out of here’) rather than an opportunity. 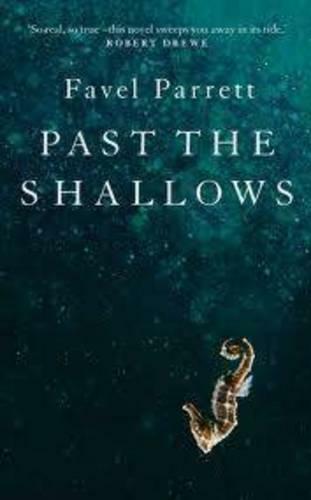 Past the Shallows is an extraordinary debut. The directness and simplicity of Parrett’s writing belies an astonishing sensitivity to the secret lives of these boys and the brutal environment that has shaped them. Justine Douglas is the manager of Readings Port Melbourne.